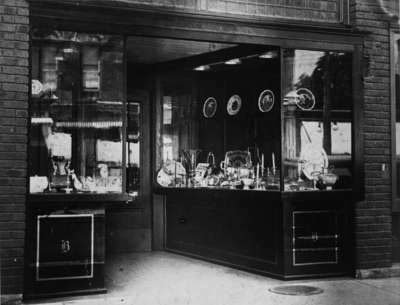 A black and white photograph of the storefront at Bassett’s Jewelry. Mack Bassett operated this jewelry store from 1937 to 1983 at 106 Brock Street North (on the west side of Brock Street – one door north of Allin’s Drugstore). Bassett’s Jewelry Storefront, 1938, Photographer Unknown. Whitby Archives 01-000-215.